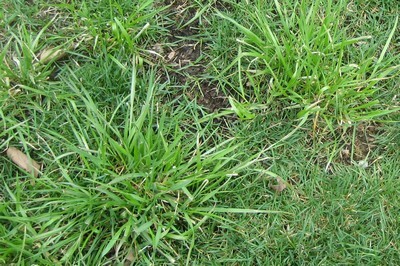 Tall fescue is a wide-bladed clump grass commonly used in lawns for sports fields because of its tolerance to wear. In a home lawn, many people do not like the tall fescues because: 1. they are lighter green in colour; 2. they have wider grass blades; 3. they grow in clumps and stand out from the Kentucky bluegrass. This textural difference of fescue from bluegrass and the interruption in uniformity makes tall fescue a weed in some lawns. You can dig out the clumps, but ensure that all tall fescue roots are removed. Then re-seed or re-sod after removal. You can spray clumps with a non selective herbicide that contains glyphosate. Remember, though, that this will harm any grass that it is sprayed on.